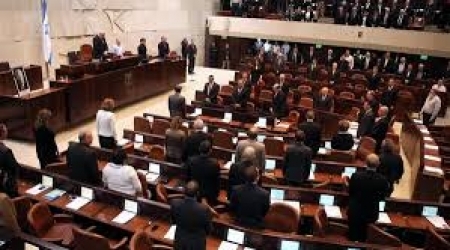 The Israeli parliament of the Knesset passed a controversial counterterrorism bill in its first reading, on Thursday, when 45 members voted in favor of the bill, while 14 voted against.According to Al Ray, the bill, which consists of 104 pages, will be introduced to the committees of Constitution, law and justice to be prepared for the second and third reading. It increases the Israeli occupational government’s authority and expands the definition of what constitutes a ‘terrorist organization’. The bill stated that the punishment of those who help the ‘terrorist’ is the same as the terrorist himself. It also raises the maximum penalty for many offenses linked to ‘terrorism’ to 30 years of actual imprisonment, and three years of actual imprisonment punishment for those who support a ‘terrorist organization’. The bill gave the Israeli Minister of Security the authority to announce any group which supports a ‘terrorist organization’, even if it does not conduct any terrorist actions. It also provides two years imprisonment for anyone over 12 years who has activity in charity organization or simply wears a shirt with expressions of solidarity with the organization. It also allows the submission of written testimony to the court without bringing in witnesses. It also allows the arrest of people for 48 hours, and without access to legal counsel or appearing before a court to extend the arrest. It gives the general security service (Shin Bet) the authority to use computerized monitoring to follow the suspected people via Israeli Prime Minister authentication only.